If your favourite things are video games, mini golf, steam punk and going on adventures, then we've just found the meaning of your life. Vertiginous Golf is all of those things happening at the same time. No, you're not dreaming. No, I'm not lying to you. You'll be able to get it on Steam come May 6, or else you can get it right now in Early Access. Off you go! For the rest of us who don't really care about steam punk or golf, it still looks like a pretty sweet action puzzle game. 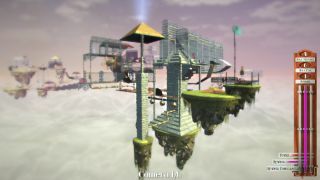 PC Gamer's Craig Pearson rated it highly when he played it last year, advising that the "levels are gorgeous puzzles that challenge your ability to perfectly plonk a ball". Basically, it's only a golf game by name. Th final game will boast a level editor, adventure mode, and both local and online multiplayer, with up to 100 courses to master / solve.